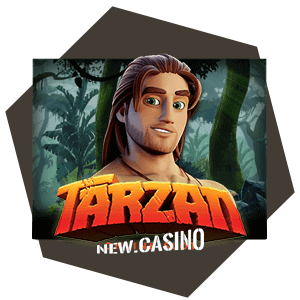 Tarzan Slot - Microgamings take on the classic hero! Who here doesn’t know about the beloved hero of the jungle, Tarzan? Tarzan has become a synonym for a person that’s fully grown inside the jungle – with the help of primates. There’s an animated version of the story, there’s a book, and there’s a movie as well. Well, that’s not all; as there is even a slot game with the same topic. Namely, the company of Microgaming has bought the rights for Tarzan, and they have made a slot game. Should you check it out? Is the game worthy of the name “Tarzan”? As is the case with most games made by Microgaming, Tarzan doesn’t fail to deliver on the promise of having beautiful graphics and animated features. And fact of the matter is that most people enjoy watching greenery of any kind – the jungle is something that people typically enjoy looking at, for no other reason than the fact that it’s beautiful to look at. So, Micrograming hasn’t outdone itself with the graphics – but be sure to expect that you will see something beautiful in this game. The music itself though is nothing special. It’s exactly what you’d expect for a slot game made for Tarzan – it sounds like “jungle music”. But it’s nothing beautiful, and chances are that you will find yourself opting out to use the option for muting the music. As you would expect, the symbols are all made to the tune of the Tarzan franchise. You will be able to see various characters, as well as animals associated with Tarzan. And of course, all of them have different values – you should consult the pay table for more information on what symbol has what value. Now, there are special symbols as well – and there is even a bonus game. You’re well aware that most slot games nowadays feature the so called wild symbol, and that the sole purpose of this wild symbol is to take the place of any other symbol in the game – except the bonus symbols. So, if you happen to need another “Tarzan” symbol in order to complete a winning combination on the reels, then the wild symbol can take its place. The same goes if you need a leopard symbol – or any other symbol. And there’s a scatter symbol which will bring you free spins; and even access to a bonus game, aptly called “pickapotamus” game. Here you will be able to pick a hippopotamus in order to win some money. There are also some extra features during the free spins – you will be able to get increased chances of winnings, and also you will get enhanced wild symbols. Is Tarzan Slot worth it? Tarzan slot game is well worth giving a shot to, especially if you’re a fan of the story behind the character. But in all other cases, you will be able to find something better to spend your time on. This is not the worst game of Microgaming – but neither it is the best.